Slightly more than half of our survey respondents represent companies with less than $5B (USD) in annual revenue. Note: The darker the color, the more responses from that state. (California had the most responses with 40+). 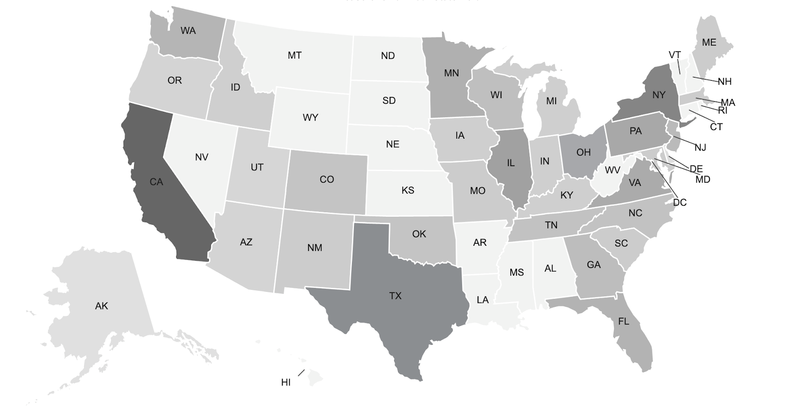 States that are the lightest color (e.g. MT, ND, SD, etc.) did not receive any respondent data. This information is provided to give you a general sense of where our survey respondents work and live because geography is a factor in compensation. As noted, two-thirds of our survey respondents identified as female and one-third, male. 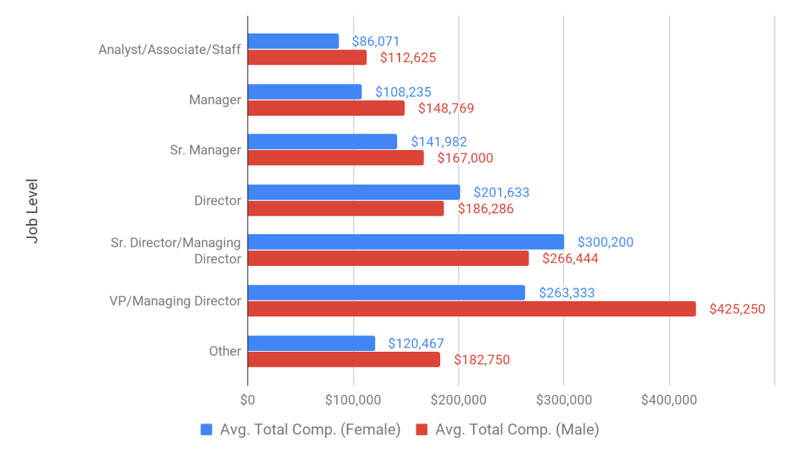 Overall, pay for female legal ops professionals lags behind their male counterparts at all job levels except Director and Senior Director. Please note: These data are based on a relatively small sample size (most notably for Senior Director and VP/Managing Director). Numbers represent total 2017 compensation. Job level is highly indicative of compensation. 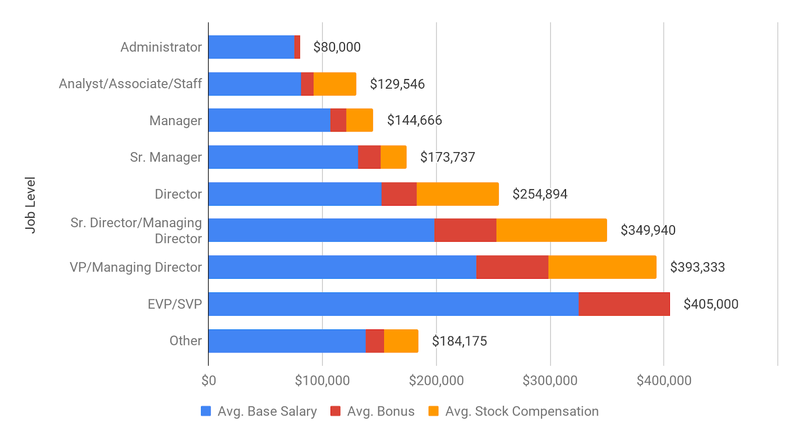 We’ve broken down the average 2017 compensation across three categories – base salary, bonus, and stock compensation – for eight distinct job levels. Note: Each of these figures (Base, Bonus, Stock) were surveyed as separate data points. The numbers below are an average of each data point for the responses received. Not every respondent replied to each question. Survey respondents who lead their organization’s legal operations function make $176,000 in total compensation on average. Survey respondents who do not lead their legal operations function make $139,000 on average. It should be noted that professionals who lead their legal operations function span a variety of titles and levels depending on organization size and corporate structure. 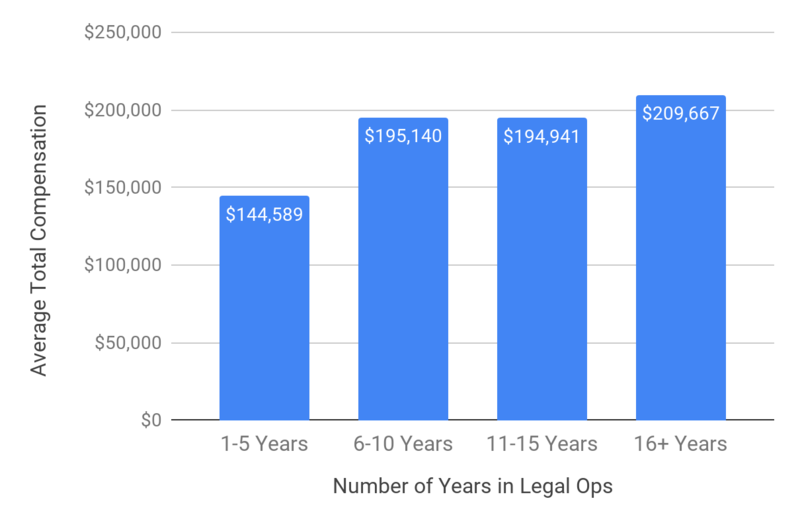 Unsurprisingly, the more legal ops experience one has, the higher the pay. 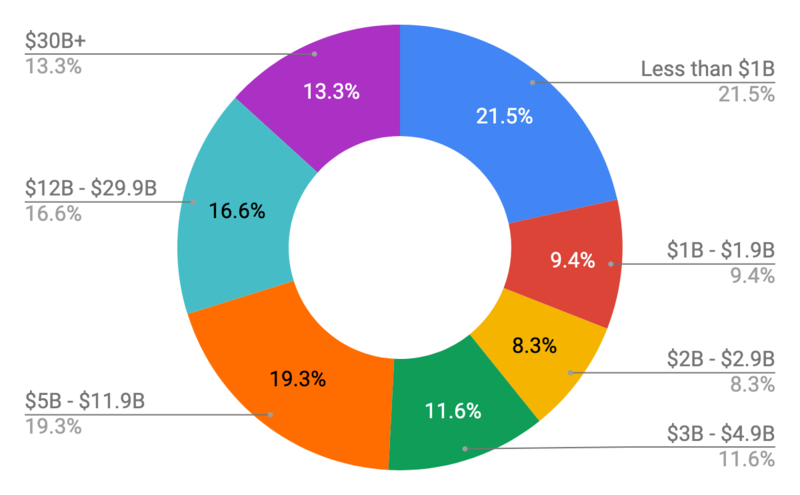 See the breakdown based on four bands of experience below. Note: All data are an average of total 2017 compensation. 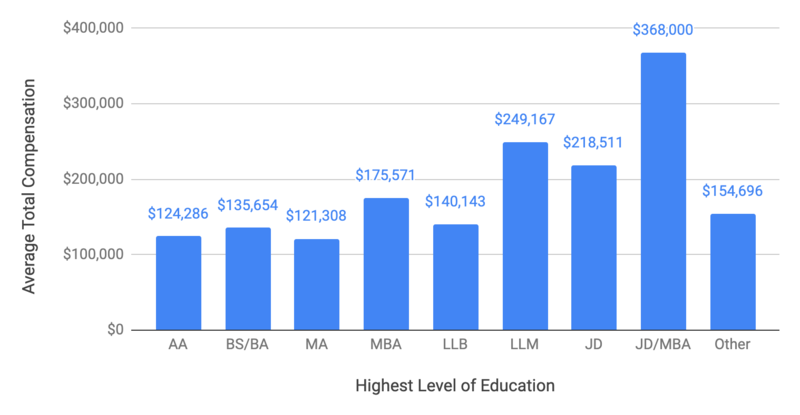 Level of education is highly correlated with compensation. Legal ops professionals with a JD degree make an average of 59% more than legal ops professionals whose highest level of education is a Bachelor’s degree. Similarly, professionals with an MBA make 29% more than those with only a Bachelor’s degree. Please note: Job level is also highly correlated with one’s level of education which also explains the pay differentiation. Total compensation is moderately correlated with organization size. 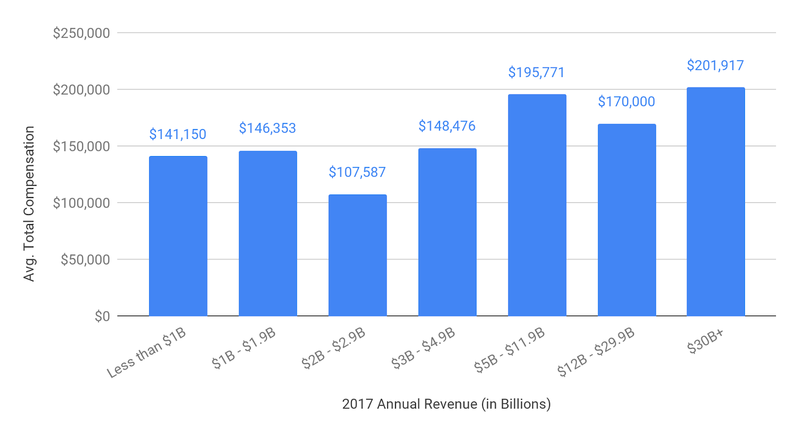 Legal ops professionals who work at organizations with more than $5B in annual revenue on average make $190,000 per year. Legal ops professionals at organizations with less than $5B per year make $138,000 on average. All figures are total compensation. Want to learn more about corporate legal industry trends? Attend CLOC’s 4th annual Institute, May 14-16, 2019 at Bellagio Las Vegas.